1991 was an interesting year for G.I. Joe. The ARAH line had been going strong for 10 years, the Sunbow cartoon was gone and replaced by the sub-par (understatement of the year!) DiC series, and the competition in the toy aisle was becoming fiercer. With the threat of lines like Captain Planet and the Teenage Mutant Ninja Turtles battling for kids’ attention, the Joe line became less military and more fantastic—including in its choice of color scheme. Yet, in the midst of this came a decidedly sinister-looking figure in a dark mask and a decidedly more military appearance. Seemingly taking over the specialty of Dr. Mindbender, the Interrogator was a little-used character in the Joe media and yet he’s been a fan-favorite for decades. Were you a fan, Dr. Chung? Not really. 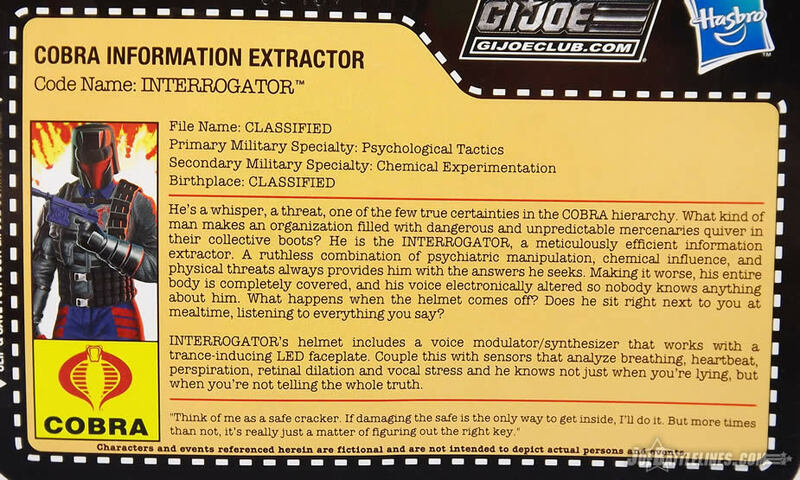 Interrogator came out when I was in high school, and even though my interest in G.I. Joe was waning at the time, I still picked him up because he looked cool. 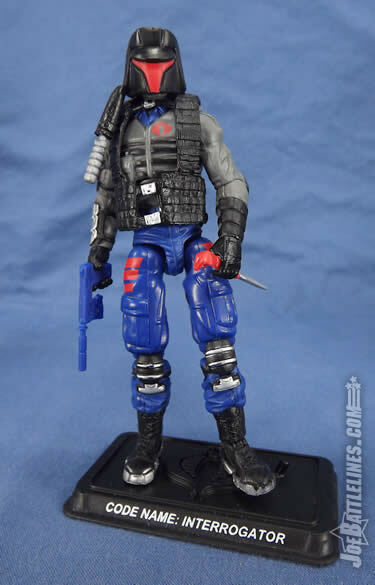 But after that he became a nearly forgotten character until a decade and a half later when he showed up in 2006 in the DDP comics as part of The Plague team, and on the shelves in a Toys ‘R Us exclusive 6-pack. 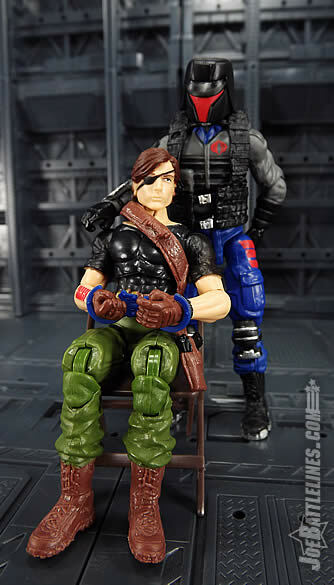 He surfaced again as part of a JoeCon set in 2010, and he appears again now in the FSS. While I can’t say Interrogator was ever on any of my top ten lists, I do understand why he was included here. I just wish the execution was better, as we’ll discuss below. 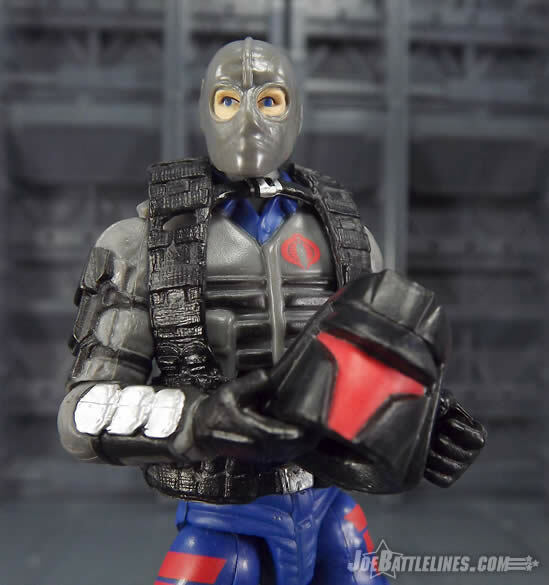 Interrogator is made up of parts mostly taken from Retaliation Cobra Commander, with legs from Destro and a nondescript masked head from Flash. 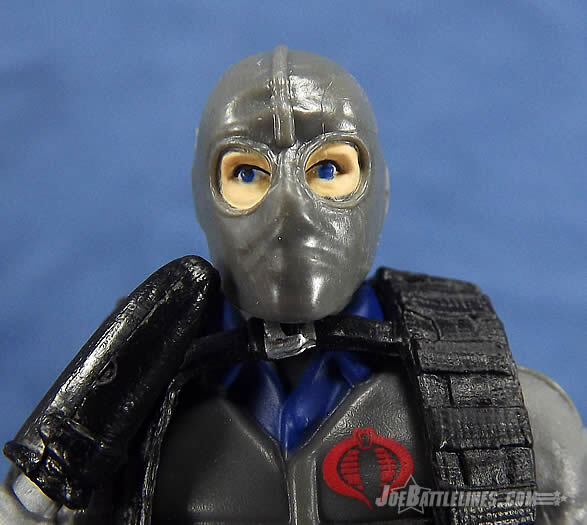 The generic head is a disappointment, considering the last time the Club made an Interrogator figure (2010) they gave him an unmasked face. That should have been carried over to the modern styled figure to give him some added value, rather than being a poorly designed FrankenJoe. The problems only compound themselves: the Flash head wasn’t designed to fit the helmet, so it’s very difficult to pull the helmet off without pulling the head off the neck post. 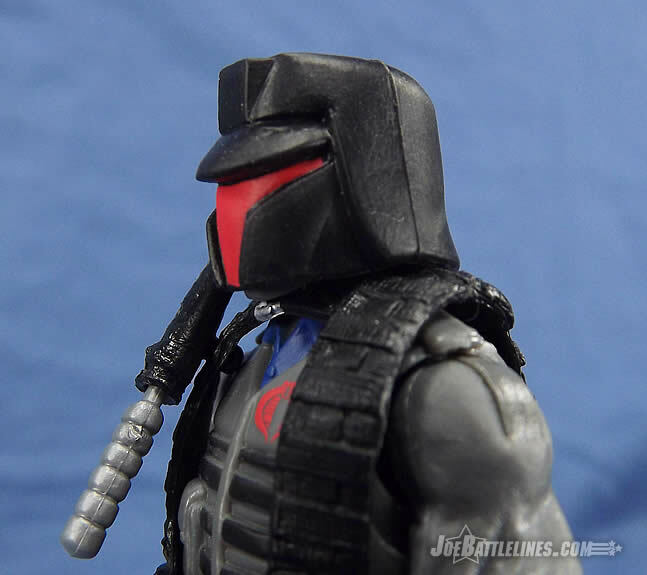 And speaking of the neck post, it’s very short and wasn’t designed for the head or helmet, so it doesn’t matter if you take his helmet off or leave it on; Interrogator literally has no real neck to speak of. It’s an awful oversight that should have never happened. I mean seriously, just look at him from behind! His head sits on top of a body with no neck. I’m just going to jump in to say that the 2010 version had a proportionately crazy long neck and his one has virtually no neck. I guess we’re playing the law of averages here? Apparently, though I never bought the 2010 version. 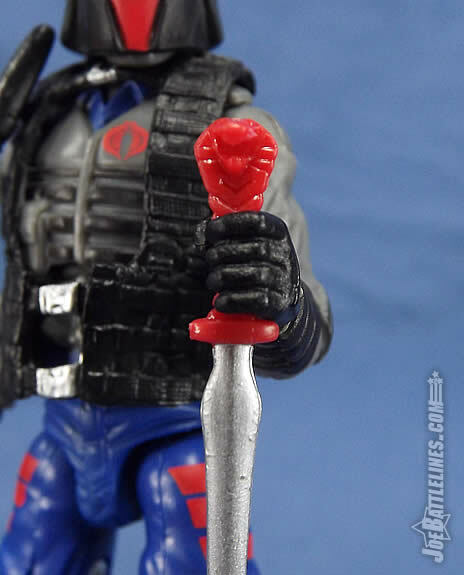 In addition to the head, the Destro legs the Club chose to use are way, way too long compared to the torso, so he looks like a disproportionate freak. 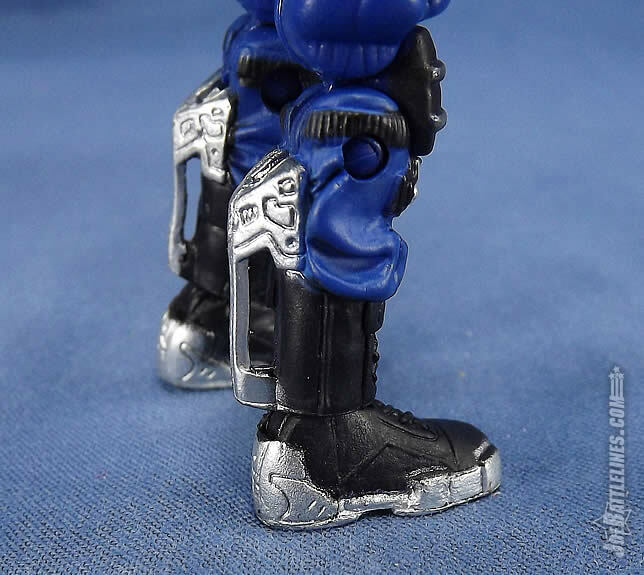 It also doesn’t help the thighs weren’t designed to be used with that torso, so they bulge out at the hip joints. This is further accentuated by the red stripes on his pants that immediately call attention to his problem areas. 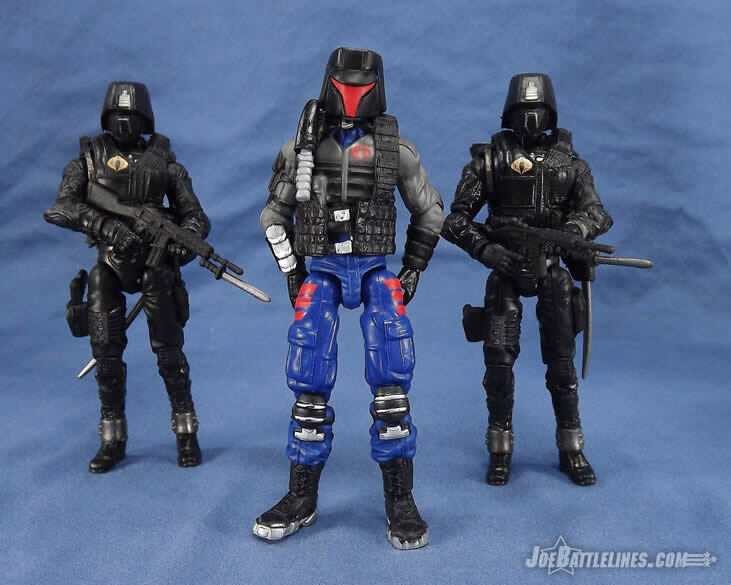 Ironically if the Club would have also kept the Cobra Commander legs that went with this body, it would be more true to the vintage figure’s design and height. But they probably wanted to “shake things up” so it wasn’t the same parts. I can appreciate that sentiment if someone competent was doing these. However once again, this is a case of an amateur non-customizer working at the Club making part decisions on figures who doesn’t have an eye for proportion or aesthetic. Or worse, they don’t care about it. I didn’t feel like interrupting Chris’ design thesis, but I share many of his concerns. It seems to me that the trend of formover function continues with this particular figure. I’m not a customizer but it seems like he was built by someone whose sole focus was cobble together a figure that looks like the vintage figure but is really ultimately designed to be left in a static pose on a shelf. Chris’ comments about the head and helmet ring true and even the choice of legs seems odd to me. This is a classic example of a figure design that probably looked great on paper but that didn’t come together as well as the designer envisioned. Sadly you can say that about most of FSS as a whole. 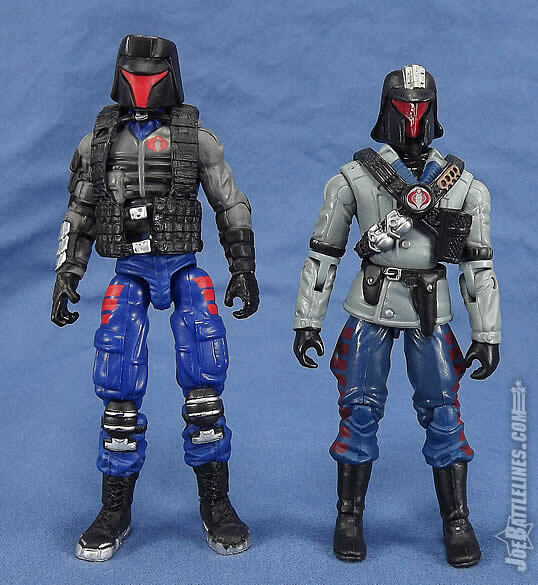 As for deco, Interrogator’s colors match fairly well with his vintage counterpart---though I dislike the silver detailing on his boot soles. Like the stripes on his thighs, the silver immediately calls attention to problematic legs. Fred, am I missing anything else? The head. Gods, the head. What is up with that head? If you as a designer go to all the trouble to give a figure a removable helmet, shouldn’t the head underneath be something worth seeing? In our world, yes. But in Bizarro World, no. And this figure was made in Bizarro World. Or Slopville. 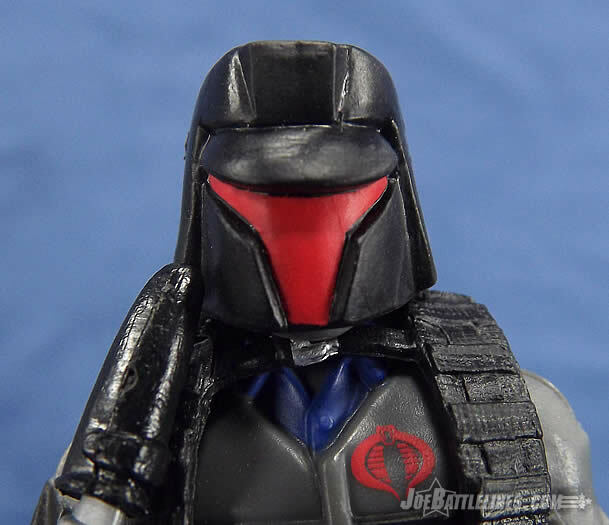 One would think, but instead we get a reuse of the Resolute “Gimp” Firefly head that just looks off. 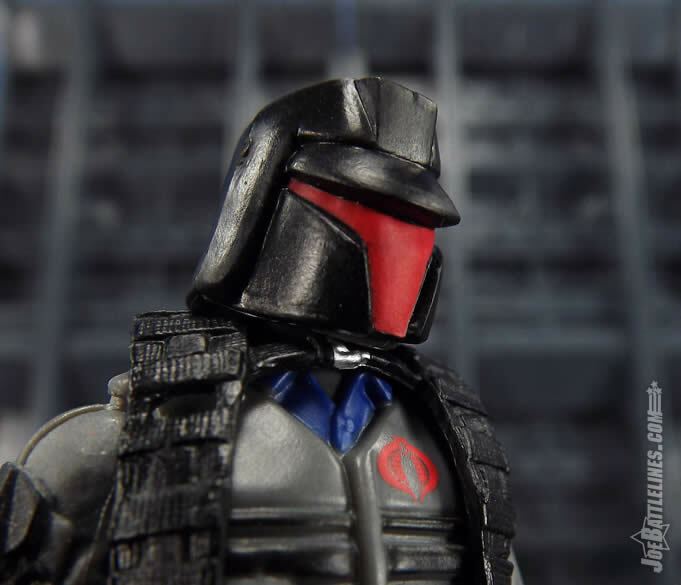 Let’s be honest—the signature element of the Interrogator is his helmet. As such, how many fans are going to display without that head piece? I’d rather have seen the Club actuallyspend some money to tool a new helmeted head for this figure than use this combination. It’s not like they couldn’t reuse the tooling in the final Fun Publications Convention set for the second version of the character! Interrogator comes with an eclectic array of accessories. 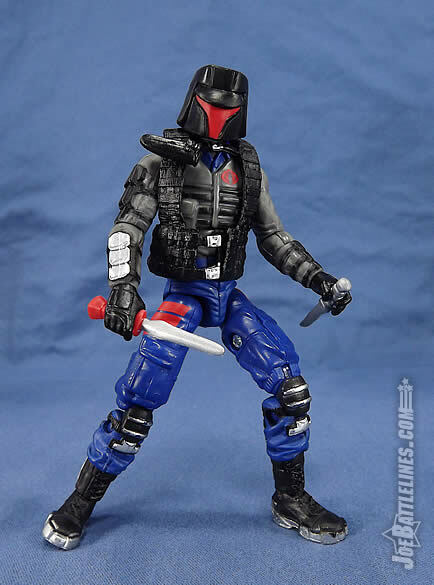 His only ranged weapon is the MK 23 pistol, but that makes sense because he’s not a frontline fighter. His job is inside the base conducting interrogations, so it would stand to reason he’d only carry an administrative sidearm as a personal defense weapon. Even the sheathed dagger makes sense; as do the handcuffs. But a short sword and nunchuks? Those just seem like kibble thrown in to pad his accessory offerings. Fred, you’re our primitive weapon specialist, any idea why he has those two melee weapons? Those are nunchuks? I assumed that is was a dual baton stun weapon. Yup. They just have a clip to keep them attached. Maybe that threw you off. Man, I need to watch more martial arts films… To be fair, they can be stun batons if you want. The kit is “okay” in my eyes. I don’t mind the elaborate dagger that Chris refers to as a short sword. Dude, it’s a short sword. It’s like a foot long!The snake head pommel clearly makes it masterwork, maybe even +1. I see it more as a weapon of intimidation than I do something that is actually to be used. It’s the item that he casually twirls and gestures with during an interrogation where the anticipation of what he’ll do with it is far worse than the realization. 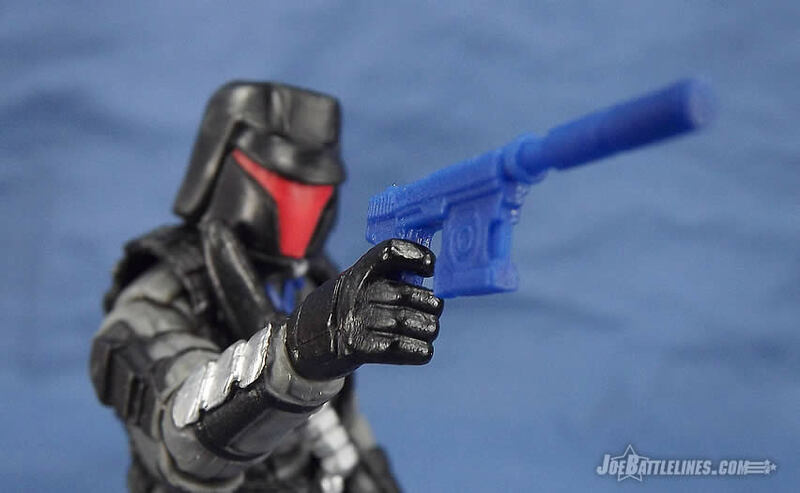 As far as the rest, I don’t know why the Interrogator is given a tactical vest and a pistol simply because he’s never going to be on the battlefield. I will point out that I removed that annoying knife sheath from his web gear almost immediately. It was interfering with the head movement and would rotate at anything more than a casual glance. Again, form over function seems to rule the day with this FSS series. As for the rest of his gear, as mentioned above, the helmet was designed to fit the O-ring styled head made back in 2010, not the Flash one, so there will be issues if you want to remove the helmet. (It’s better to just leave it on and be done with it.) Another issue is the webgear: It’s passable, but the dagger sheath spins around in an annoying manner, and will probably need to be glued down---or removed like what Fred did if you don’t want to deal with it. Also, the webgear’s upper torso strap is mounted too high on the chest, so it runs right under his chin because his non-existent neck is too short to realistically prop up the head. Finally, I’m not keen on his weapon color. 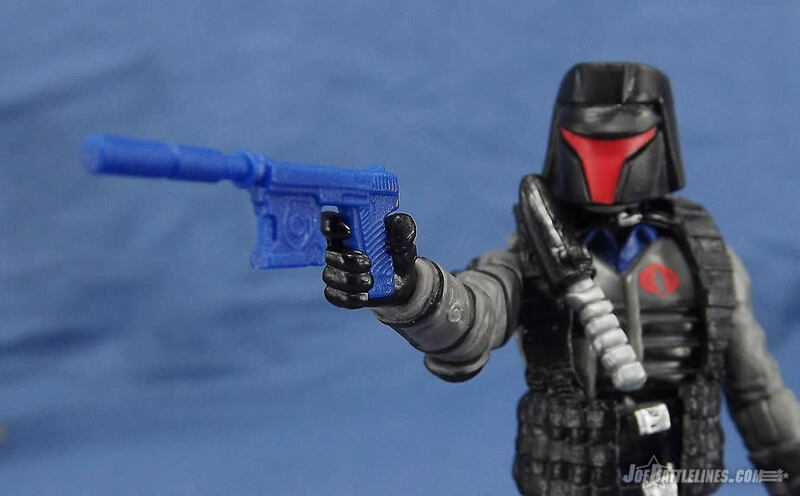 Interrogator never, ever had blue guns, so why was that unrealistic coloration used here? Again, Fred, any ideas? 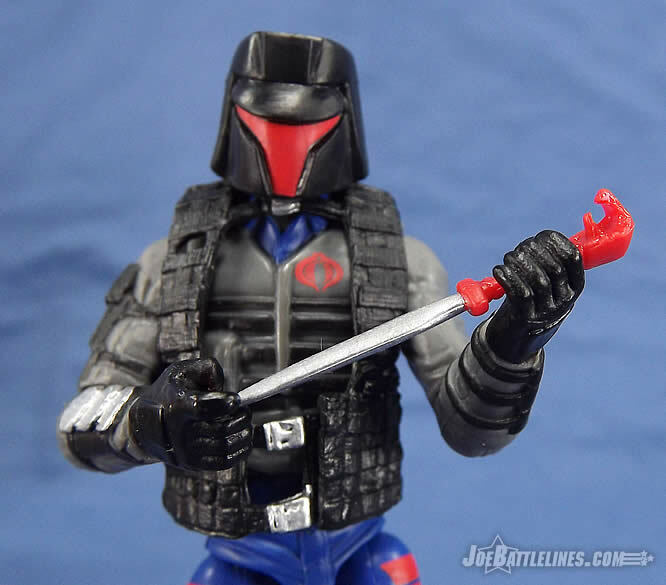 I almost wonder if the blue weapons are a response to all of the comments made at the 2015 Joe Con about how the Club figures always comes with gray weapons. Personally I never found this to be an issue. 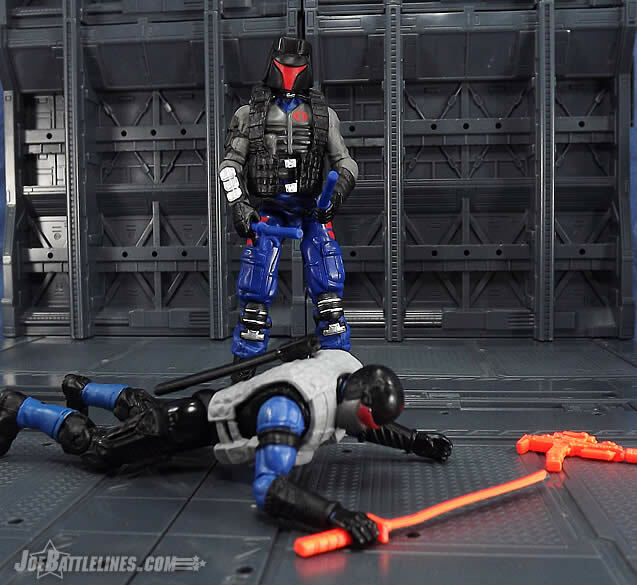 In this case it’s not because there are plenty of black MK 23s that came out in RoC, but for other weapons it is an issue because it’s the Club being needlessly stubborn by making guns in kiddie Crayola colors. If they were actually this stubborn about making good figure builds, we’d actually be in great shape right now. 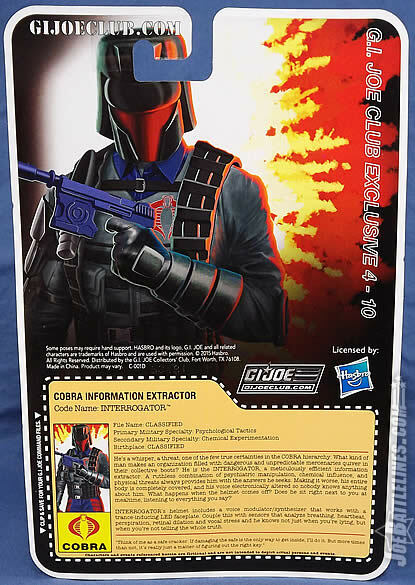 As I said during my Facebook Live unboxing video, I never saw the Interrogator as someone who would color coordinate his weapons with his outfit. 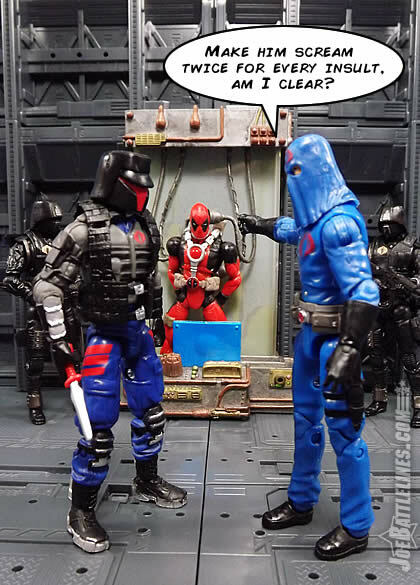 Overall Interrogator is sloppy. He’s a poorly designed and mismanaged excuse of a figure that should have been much better. 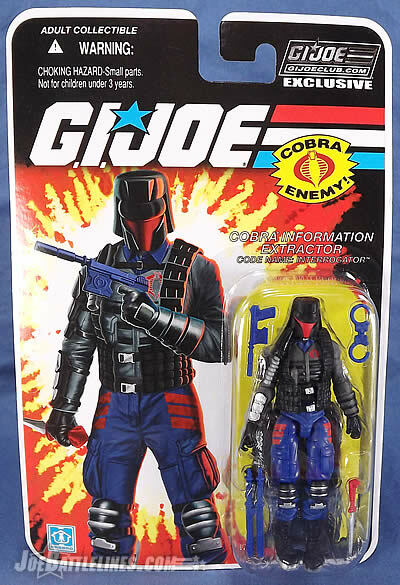 Normally I’d get rid of backwash like this, but I’m torn because he is one of the few remaining named Cobra individuals left to see a modern remake, and that at least gives him some worth. (But very little.) 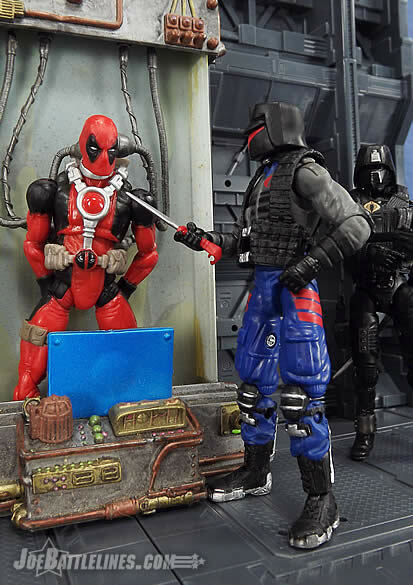 I can’t recommend the casual buyer purchasing this figure on the secondary market because the inflated d-bag scalper prices will be too much for the junk this figure is. 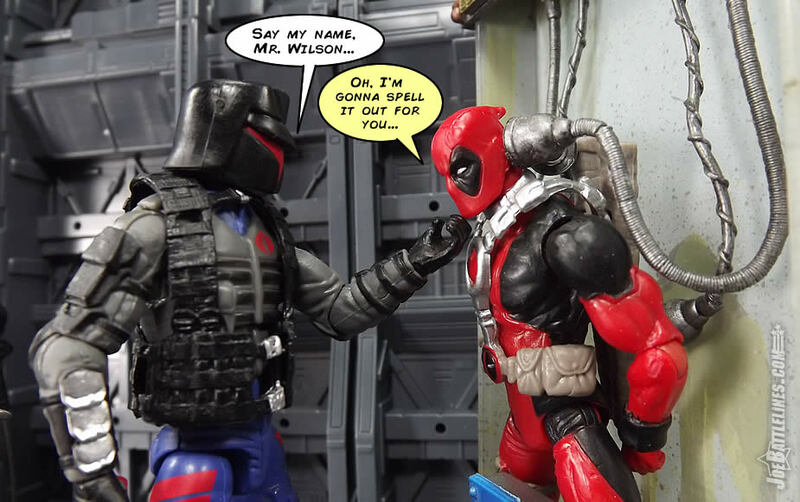 However, fans of the character who can overlook proportion issues may find him worthwhile. 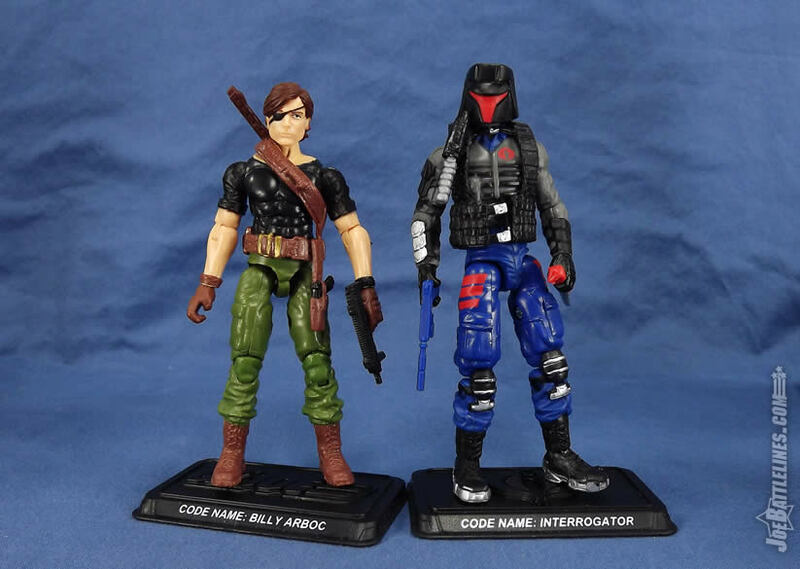 Is the FSS Interrogator worth owning? Man, this is a tough question. Years ago, back in the heyday of the JBL forums, there was a group fan fiction called “A Day in the Life”. Each person took two characters (one Joe and one “other”) and wrote daily entries on what had happened that day. The result was a dynamic intricate group story that took on a life of its own. In the last go-around I had picked the characters of Scoop and part of the tale involved him being capture and psychologically broken down by the Interrogator. As such, I formed a strong attachment to the character which meant that this was one of my most-anticipated figure in FSS 4. I guess the anticipation seldom lives up the realization because I find the actual figure to be pretty “meh.” I recall you said the same thing to me when we finally met face-to-face. I cried for weeks. Sure, he looks the part and the key elements are all there but they just fail to come together in the same way that other Club figures have. I don’t have the issues with the proportions that Chris does but something just feels off about this entire build and it keeps me from enjoying him as much as I had hoped I would. It’s the proportion! Ultimately, I feel like someone cobbled this figure and just said “well, that’s good enough”—and that’s not how I should feel about a $30.00+ figure. Diehard fans of the character are going to love this piece regardless of what anyone says, but for the rest of the fandom I’d say get him but don’t break the bank doing so. Of course, that’s just this Joe fan’s opinion.